They say that no-one has spent a whole night in Westminster Abbey other than the monks of old, but last month I was given the opportunity to do just that having been invited to an all-night event to mark the 400th birthday of the King James Bible. The 66 books of the Bible interpreted by contemporary writers, poets and musicians to be performed over 12 hours in the Abbey, Friday night into Saturday morning. This was to give me the opportunity to sketch through the night, experiencing the Abbey in its hours of rest. A year ago I had embarked on a long-term project to paint at Westminster Abbey, providing a challenging seriousness, both as the repository for so much of our national history, and as a complicated subject to paint. It also appealed to me because it has been painted by few artists in the past. Refreshing when many of my recent subjects – like Rome and Venice – have been painted by everyone. I would be able to explore the spirit of the Abbey without seeing it through the eyes of others. It is certainly peculiar, a Royal Peculiar – part church, part royal palace. It’s the final resting place of kings, the place of coronations and state funerals. It is the ancient seat of the church and of parliament. In short it is a massive history lesson. I had a lot to learn. Where to begin? I had visited on several occasions over the last year, to sketch and paint while the Abbey is quiet between services on Sundays and in great contrast during the celebrations of the Royal Wedding last April. 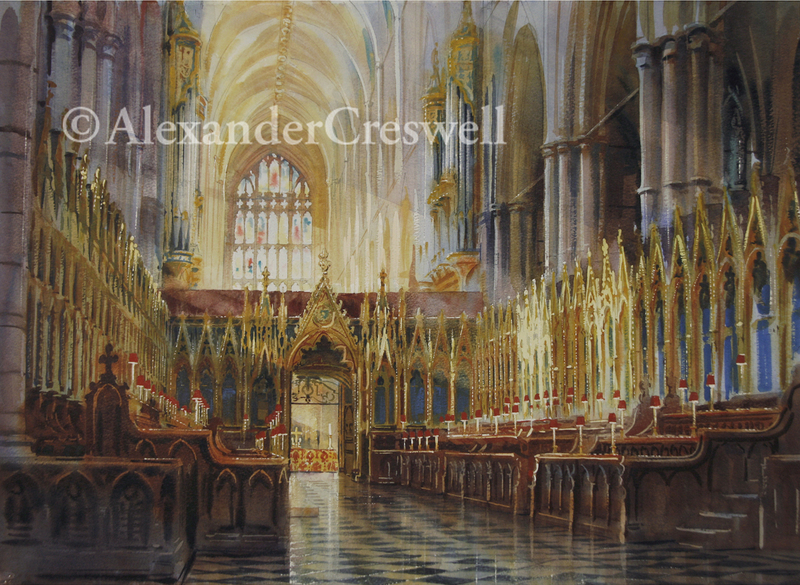 I had completed my first work, a large view of the interior of Henry VII’s Lady Chapel, quite to my satisfaction and had taken great pleasure in recording the Royal Wedding service in sketches and as a large finished painting. I also completed a few smaller paintings of details around the Abbey. In truth I was uncertain about the overnight session. I felt that Westminster Abbey still wasn’t quite my place. Not yet. We weren’t on first-name terms. I had only prodded the creature with a long stick, so to speak. We arrived wrapped in warm coats with pockets full of biscuits anticipating a cold hungry night. In the nave a stage had been placed on the north side, with chairs arranged for the audience, three sides of a square. The lighting was subdued, spotlights on the performers and darkness hanging overhead. The vaults disappeared, night invading the volume of the tall space. It was too quiet to start sketching, scratchy noises on hard paper. I rather wanted someone to play the organ loudly. I sat and gazed up, unsure how to begin an all night conversation with the great Abbey. The audience, some 30 strangers, moved into the Henry VII Chapel, the delicate fan-vaulted Lady Chapel which I had painted already with a delicate morning sun percolating across the intricate carved stonework. Now the windows were black and the interior turned in on itself. The wooden stalls wrapped around the small audience with the banners of the Order of the Bath waving gently in the convection drafts from heaters under the floor grating. It was warm sitting in the aged oak stalls and benign. I gazed up into the fan-vault, not really listening to the play being enacted in front of us, my eyes travelling over the intricate patterns which I had drawn months before, captivated by the miracle of craftsmanship which had enabled this tonnage of stonework to be suspended safely above our heads for five hundred years. Incredible. Now, at night, it seemed the achievement was greater, the stone seemed heavier. In daylight the air can be thick with motes of dust, of atmosphere, visible in rays of sunlight. Air almost liquid like water in a pool, with the vault floating on the surface, viscous. Now the dark air, thin and cold, had devoured the rays of light and the echoes of the voices. The banners waved above in defence, as if trying to protect us from the darkness. As the night thickened, we walked from one space to another as the performances unfolded. We had glimpses into stoney shadows along the way, sculpted profiles gazing upward with smooth sightless eyes, elaborate drapery thrust aside by skeletal fingers, frozen in stone, once glorious banners replicated in the rigid brushwork of the sculptor. Every surface is ornamented, inscribed and populated. Names are everywhere. Identification matters not here, not now. The night envelopes all. We are all here together, dead or alive. Like it or not. The darkness softens meaning. We are lucky to be here. It’s not as cold as we’d expected. The spirit of the abbey is growing as the chimes of Big Ben signal the early hours – two maybe three – the night pregnant with another day. These are the quiet hours, the private times of night. The hour is hostile but the place is benign, welcoming, a monumental shelter, the protective armour of history extending around us. In the cold cloister for an interval of strong sweet coffee and muffins, the gathered audience huddle, muttering and nodding friendly gestures. The dynamic has changed in spite of the cold there is a warmth amongst us all, we are no longer strangers. There is an exuberance, almost euphoria born of having made it this far into the early hours and an eagerness to continue. We are those who have spent the night in Westminster Abbey, almost. The actors, players, audience, the Abbey staff, we humble band of brothers, outnumbered by the dead maybe but very much alive. We would do it, see it through. Next we gathered in the Quire, just below the great pipes of the organ towering above. Hesitantly we took seats in the choir stalls, the hallowed places. This was a privilege not permitted outside Evensong. It was the reward for having grasped this opportunity, for having taken up the challenge to spend so long in silence, sketching, looking, listening, thinking. My scratchy pencil was a distraction, an agitated movement in corner of the eye of the audience. I don’t like to be overtly sketching in a quiet place. Instead I tried to load up my eyes with the vision before me, to save it for later; the Quire at night, the golden glow of the High Altar and Reredos, and the black windows above the Triforium. Black windows which turned the space in on itself. There was no outside world. This is the world. The building faces in, focussing on God inside. God is in here, not up there. God is this. Now. Here. I began to feel a sense of belonging. I was reminded of my time at Windsor Castle after the fire. I had spent time in there, alone inside the ruined castle with only pigeons for company. It had been strange, hostile and uncomfortable at first. But over time I had proven my worth as a challenger, sketching, drawing, knowing, parrying the sword of uncertainty, making my own lunges, assumptions, judgments. The place had judged me and I had judged it. It had become my friend. When you sit and draw – or just look, properly look – you begin to establish a dialogue with the place. In some cultures the depiction of the human face implies the threat of theft – if you draw the likeness you steal the soul. You take a little away in your drawing. That’s why it is a good drawing. Westminster Abbey is now my friend. I met it at an all night party.